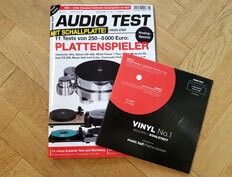 9.11.2018: For the first time the HiFi magazine Audio Test has published an issue with a dynamic reference record as an extra. Their choice was for a production by GENUIN classics: A recording of Brahms´ Hungarian Dance No. 5 by the Dresden Philharmonic Orchestra under the direction of Rafael Frühbeck de Burgos, which appeared on the GENUIN CD "Encore!" Audio Test chose a GENUIN recording for this extra, as the Leipzig label "...was and is the godfather for so many grandiose, high-resolution classical pieces," as Digitalfernsehen writes. Naturally, we are delighted with the laurels and faith in our quality and are already browsing through this special issue of the magazine with interest.